When you first enter you will encounter and army of dwarves. Chat with Horin if you wish to track your progress throughout the raid (allows you to continue on the boss you left off on). It will bestow The Anvil of Winterstith (insert tier) quest. T1 – Resets every Monday, Thursday, and Saturday at 3am EST. T2 – Resets every Thursday at 3am EST. T3 – Resets every Thursday at 3am EST. Unlike most previous LOTRO raids, The Anvil of Winterstith does not have boss locks; it has chest locks. This allows you to come and help kin mates or friends to complete content even if you have already done it within the reset times mentioned above. However the boss and side boss chests (loot) is locked until the aforementioned resets. This is always subjective; this is what I find works best for me. 5 DPS. Ranged is best for this fight, although Champs and Wardens should not be over-looked. Ideally at least 2 RKs for the DNFs. Kill these first. They get a Feeding Frenzy buff that tiers up over time (+10% Melee Damage and +10% Melee Crit). Each subsequent tier adds 10%. They put a debuff on you called Clinging Frost that gives you -50% frost mitigation for 2 minutes. This can stack. Frost Breath (tactical) – This a frontal cone attack. Only the tank should be getting hit by this. Clinging Breath (tactical) – This is a frontal attack that only the tank should be getting hit by. They put a Chilling Cold wound on you that does 2,652 frost damage initially and then again every 2 seconds. This is not pottable/removable. Throughout the fight, Karazgar flies overhead and periodically drops ice paths down in the arena (you will see orange circles where they will land). These are long, wide paths of ice that slow you and do frost damage. They always run in a North-South direction. 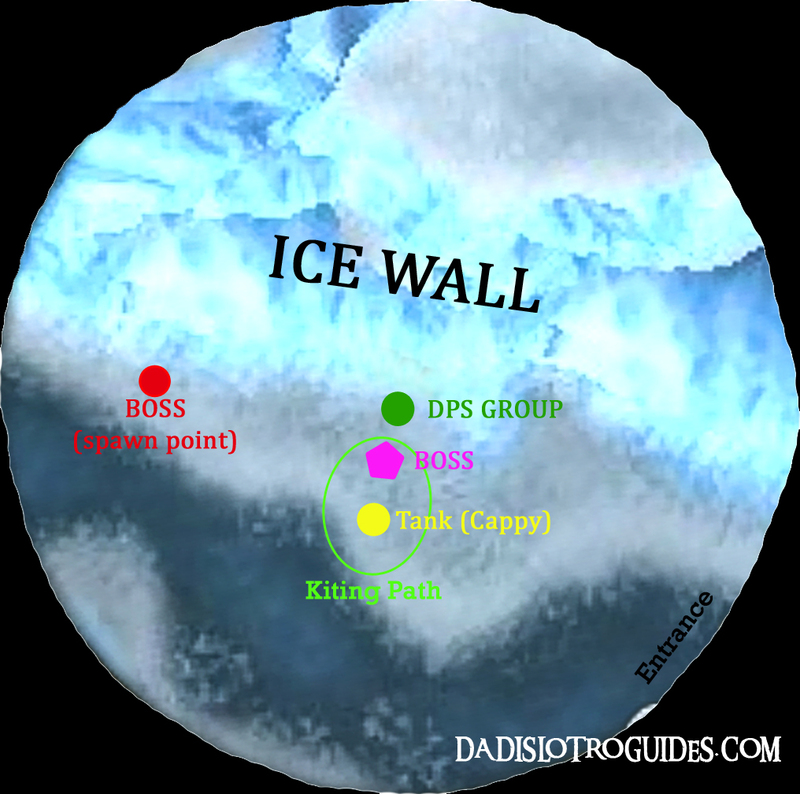 If the DPS group stands at roughly 43.4N, 37.1W (up on the ice bank) they will be safe from the ice paths. They should be facing the arena. Tank 1 (Cappy) should be positioned at roughly 43.3N, 37.1W; they will tank Isvitha the Gluttonous here. If the boss catches the person with the Food debuff she immediately gets a Well Fed buff (+20% Melee Damage and +20% Tactical Damage for 30s). 1) The person with the eye (who also receives the Flight buff (+80% run speed for 45s) kites the boss in wide circles around the Tank. They have to be careful to stay close enough for DPS to still hit the boss, but far enough that she does not catch them. They must also be mindful of the ice paths that may drop. 2) On T1 you may opt to have an RK throw a DNF on the person with the eye. The person with the eye runs to the boss and dies. They then rez and continue with the fight. This strategy is best suited for groups with high mitigations and strong healers. The boss will periodically put a blue eye on someone. She will then focus a Frost-Breath attack toward them. This attack is a frontal, cone shaped attack. The person with the eye should run to one side away from the group (but stay within heal range) or run to he tank; the healer can focus heal them. A group with enough mits and strong heals may elect to just have the person with the eye do nothing. The boss will randomly put a Fixated debuff on someone which causes it to aggro on them. If the person has good mits and a solid healer then can just run to the tank until it expires. Otherwise, the person can kite in circles around the main tank. At random points throughout the fight the Boss will wise up on all fours and begin shaking (similar to Fingar from Abyss). As soon as you see this animation make sure you are not under her or in close proximity. Turning to run away is much faster than back peddling. As soon as the Boss completes the Belly Flop everyone will be tossed backward in the air a good distance. Watch your positioning such that you do not get tossed in to an ice path. There will be random points throughout the fight that the boss will say; “Come, drakes ! Help me catch these squirmy little things !” at which point adds will spawn. The secondary tank (usually a Guard), the LM, and their dedicated healer will head toward the spawn location (red on the map). The LM debuffs the mobs and then positions themselves such that they can run to the boss and the adds easily to keep debuffs up. The tank stays in the area and and kites adds in a tight circle while the healer keeps them alive. When the second wave of adds spawn the tank is going to need to kite them all in long stretches of the arena (using Charge etc.). If the Whelplings get within range of the boss they buff her with Strength of the Horde (gives her +20% Melee Damage, +20% Melee Critical Chance, and -10% attack duration for 30s). This stacks for each Whelpling that is near her. This boss fight has a randomness to how, and when, the adds spawn. Not sure if this is WAI. To start the fight the Cappy Tank pulls the boss to the tanking spot (yellow on map). The support classes debuff the boss and the DPS has at it. Single tank. Swap out one of the tanks for more DPS. DPS the boss slowly to start, trying to get it to about 96% when the Food Debuff spawns. You want the first purple eye (Food Debuff) to spawn BEFORE the boss gets to 95% health. Kite the purple eye such that DPS does not have to move much. Burn all CDs while the eye is up (no adds spawn during this phase) to maximize DPS. Tank grabs all adds. The group ignores the adds and DPSes the Boss until dead. When adds spawn 95%, 70%, ?% the off tank should call over the Drakes. Continue DPS on the boss until it is dead. Ignore the adds. DPS the boss slowly to start, trying to get it to about 96% when the Food Debuff spawns. You want the purple eye (Food Debuff) to spawn BEFORE the boss gets to 95% health. When adds spawn 95%, 70%, ?% the off tank should aggro the Drakes. The main tank calls over the Ice-Drake. DPS kills the Frost-Drakes and then switches to the Boss. Just before the next spawn cycle, kill the Ice-Drake. Continue this rotation until the Boss is dead. When adds spawn, the main tank should call over the Ice-Drake. The off tank grabs the Frost-Drakes and Whelplings. DPS should burn down the Whelplings as quickly as possible. As soon as the Whelplings are down switch DPS back to the Boss. (Whelplings spawn every 90s from this point onward). At about 50s after the last Whelpling died (from previous phase), switch and kill the Ice-Drake. Ideally it dies just before the next round of Whelplings spawn. Continue this strategy until the boss is dead. At 9 minutes in to the fight the boss will get an Enrage Buff that essentially will cause her to one shot people she attacks. The only thing you can do is have the tank kite as long as they can and hope the DPS gets her down in time. On Tier 3 an Energized Whelpling will spawn at the 1min, 3min, 5min, 7min, and 9min marks. These will start channeling (purple mist under them) at which point they need to have a Fellowship Maneuver applied to them. If the FM does not get off they wipe everyone within 100m. Burgs, Tanks, and possibly LM (Bog Lurker) have some reliable FM opening skills.